Sound and properly working ventilation system is crucial for the comfortable kitchen environment. It is also significant for safety and health perspective. The main aim of a kitchen ventilation system is to remove grease and heat caused due to the cooking. Nowadays ventilation system has much broader role than just removing heat and grease. It provides safety in the working environment of the commercial kitchen by steer clear away carbon monoxide gasses due to the combustion process, boiling and commercial ware washing process. Best tech services execute meticulously ventilation system cleaning in London assuring workplace safety is protected. We offer convenient cleaning process without interrupting your business. Our process of removing dirt includes flue steam to carry out the task efficiently.We offer 24*7 services, so you can also choose early morning or late night shift without hampering your kitchen services. 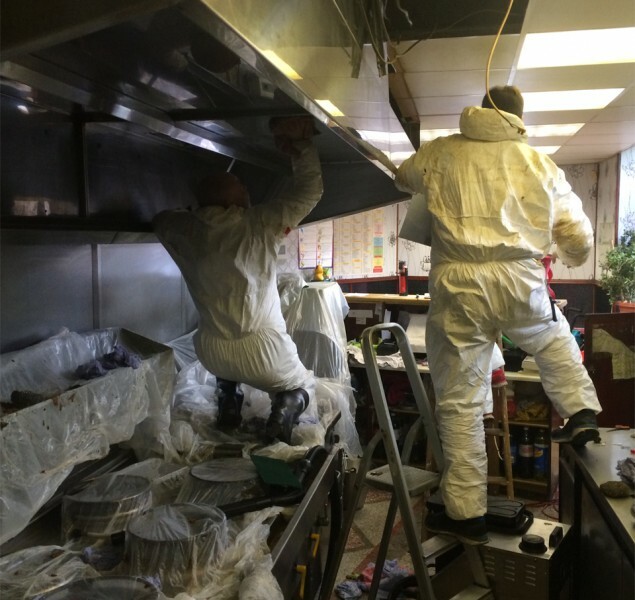 Proper extraction cleaning helps to minimize the fire risk for your commercial kitchen. Without regular and proper cleaning the grease deposited inside the duct. The deposited grease could be ignited due to the excess heat and can easily be spread through the duct. By removing the grease you eradicate the potential inflammable substances deposited inside the duct. As an employer, it is necessary for you to provide the healthiest environment. Improving working situation helps you to retain employees and enhance the productivity. Our excellent cleaning system aids you to safeguard employees from any kind of airborne diseases. Improving working environment encourages your employees to stay in the workplace for a longer period. We provide high standard and professional ventilation system cleaning in London to meet the cleaning requirement of a commercial kitchen. A clean duct and ventilation system signifies in effective ventilation process. The more efficient system results in the better performance and airflow. Thus using effective system reduces the lower cost of energy bills. So it is helpful in saving energy bills in the longer run. Why do you need cleaning of system ventilation? •	It helps to ward off the bacteria in an unclean ventilation system and deposited grease from the ventilation system. •	Compliance with the regulation otherwise your commercial insurance policy could be invalidated. •	According to the rules and regulations laws of UK, Commercial kitchen ventilation system should be compliant with Regulatory Reform (Fire Safety) Order 2005. Otherwise, failure to carry out proper cleaning and maintenance could lead to a breach of Environmental Health.